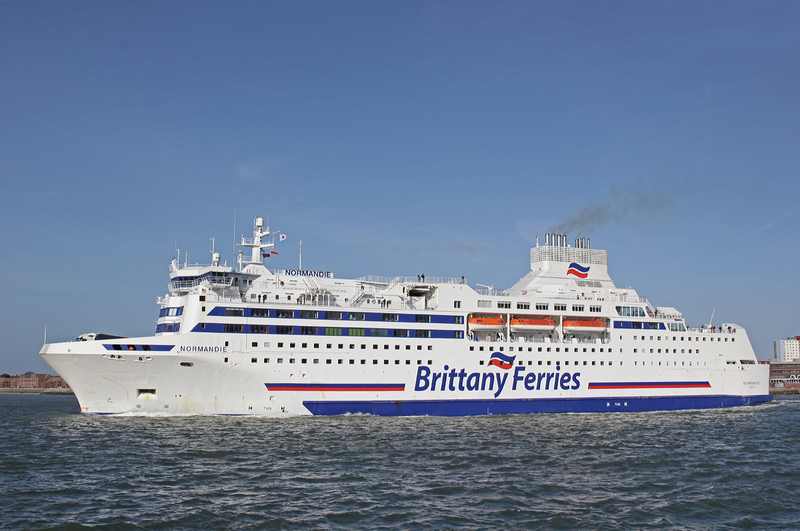 In my last photographic post I stated that we were due to travel with Brittany Ferries at the end of March. 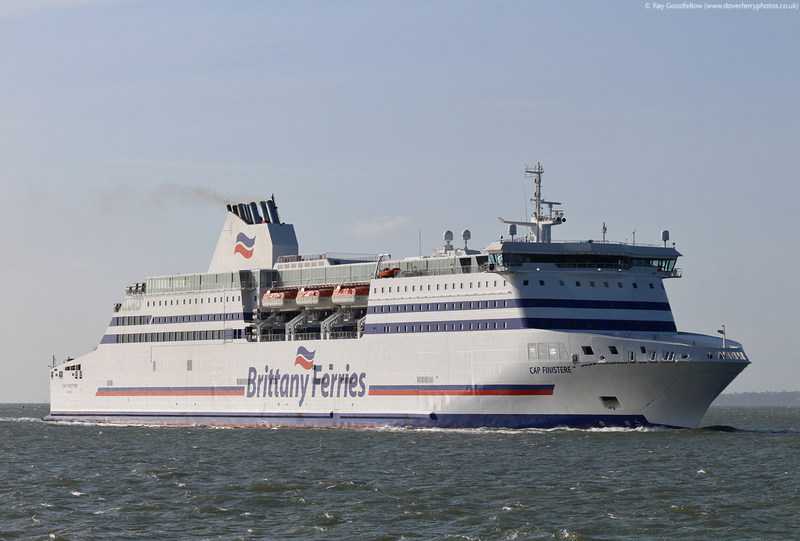 In what has become a yearly trip around the Easter period we joined the Brittany Ferries vessel Normandie on the 30th March for her overnight crossing to Caen (Ouistreham). 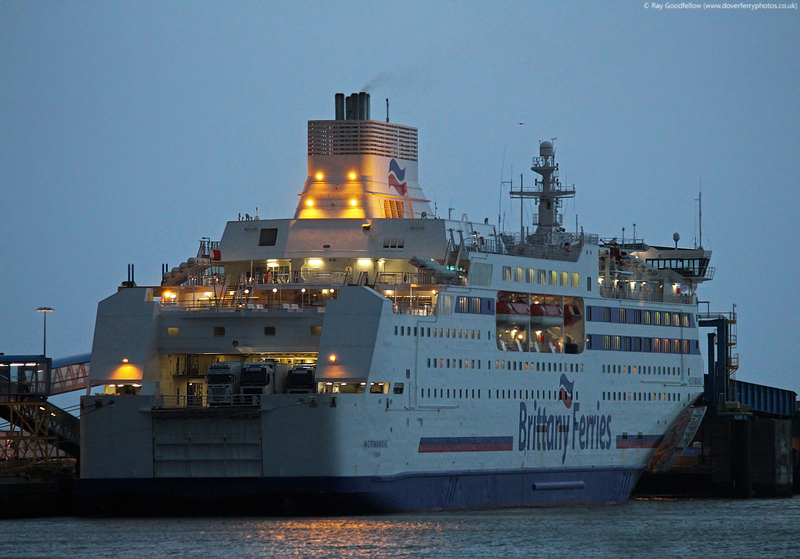 After an early morning arrival in Ouistreham on the 31st March we spent the whole day in Normandy before returning overnight to Portsmouth on the Brittany Ferries vessel Bretagne from the Breton port of St Malo. Now you maybe wondering why has he called this feature Four Seasons? Well quite simply thats down to that great British obsession/talking point, the weather. During the course of our three days away we witnessed the equivalent of all four seasons. 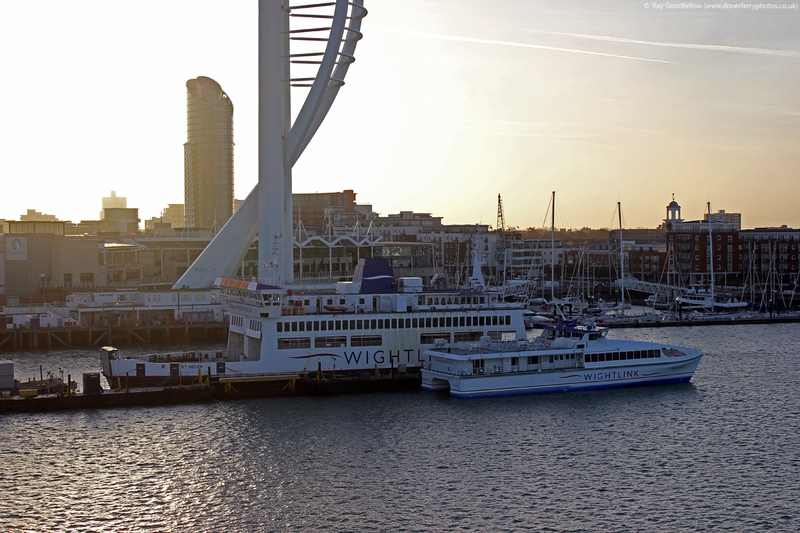 With an evening departure to Caen we decided to head to Portsmouth in the late afternoon and with plenty of time to spare we decided to pop over the the Isle of Wight doing a double trip. 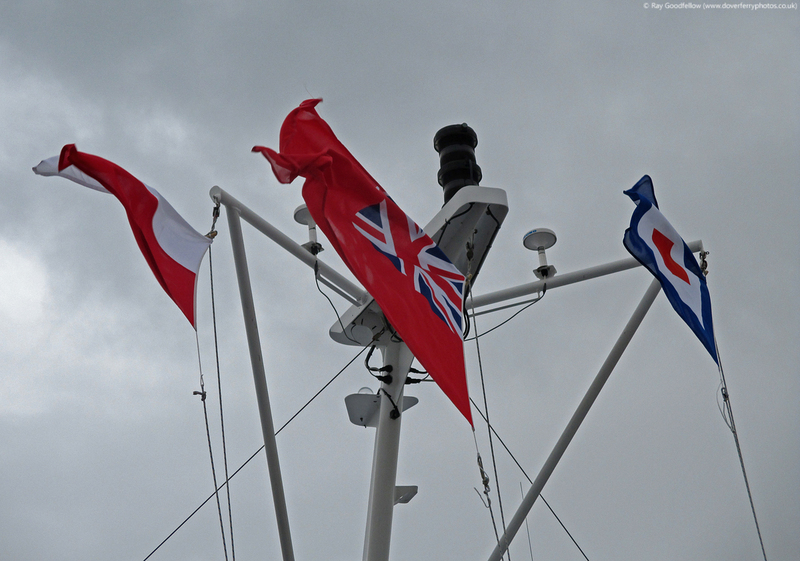 By this time the weather had started to close in and the shipping forecast certainly wasn’t looking very good for our crossing from Portsmouth to Caen on the Normandie. 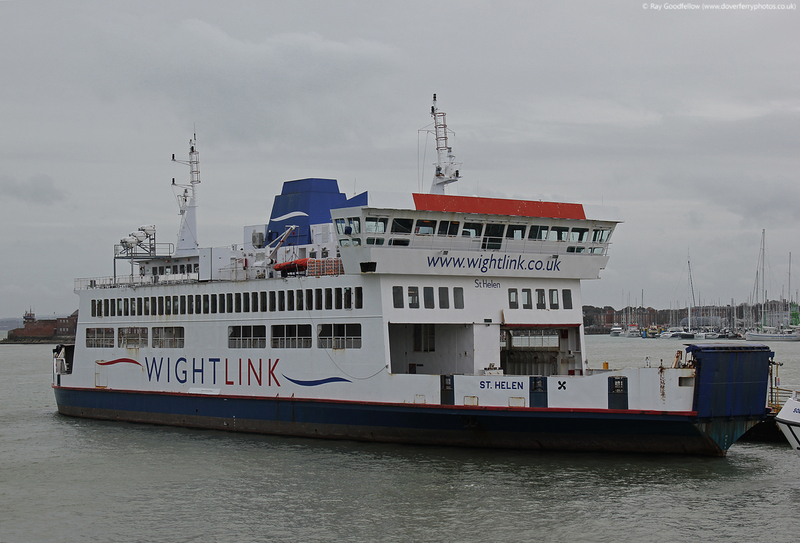 With winds expected to reach severe gale force 9 to storm 10 during the night it looked like it may be a bumpy one. 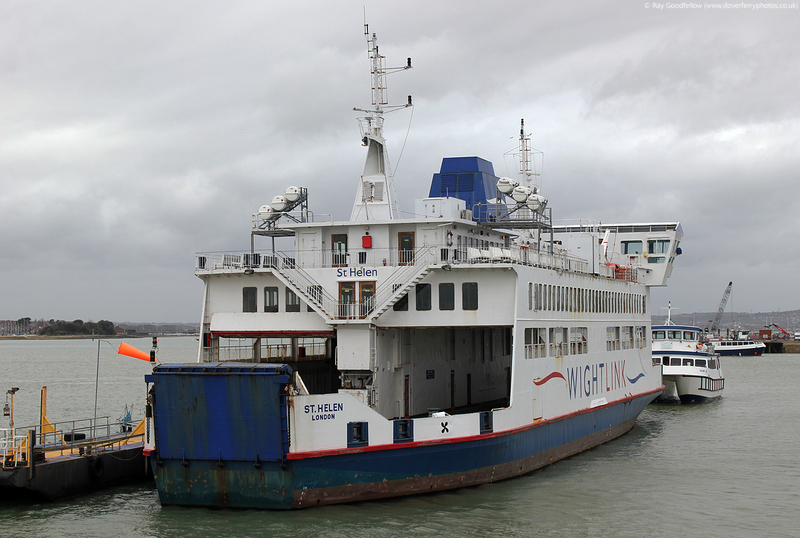 Under grey skies we headed to Portsmouth Harbour Station and boarded the Wight Ryder I for her crossing to Ryde. 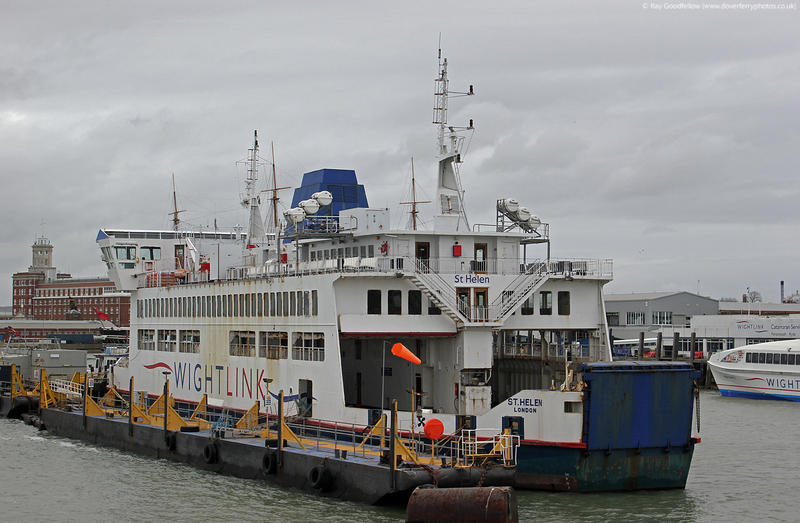 As we departed we passed the now retired Wightlink ferry St Helen which was looking rather forlorn at the Wightlink moorings. 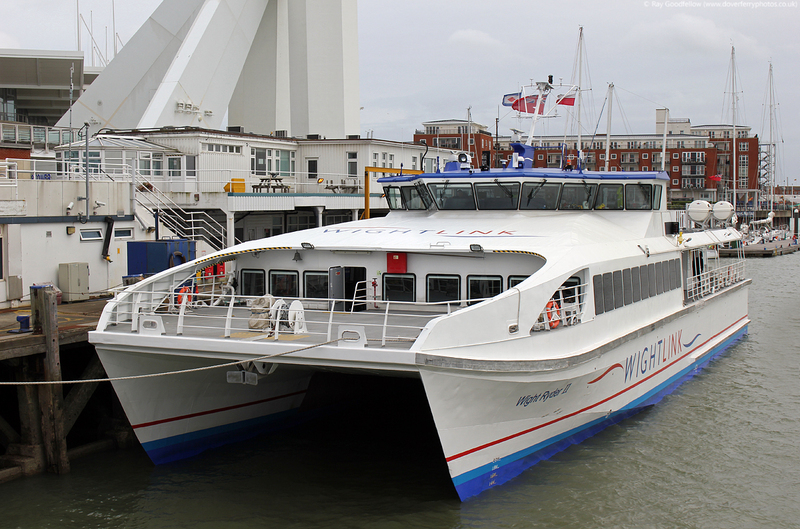 The Solent Cat was smaller and slower than the Wight Ryders but she was spacious enough. 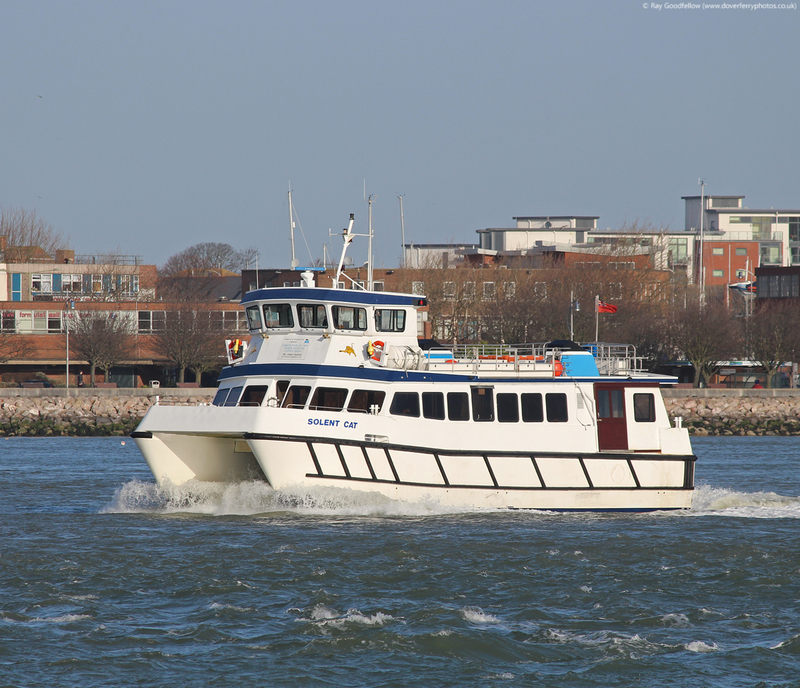 During the crossing back to Portsmouth the wind had really picked up and the crew were advising passengers to check the status of sailings if they were travelling back to Ryde later in the evening. 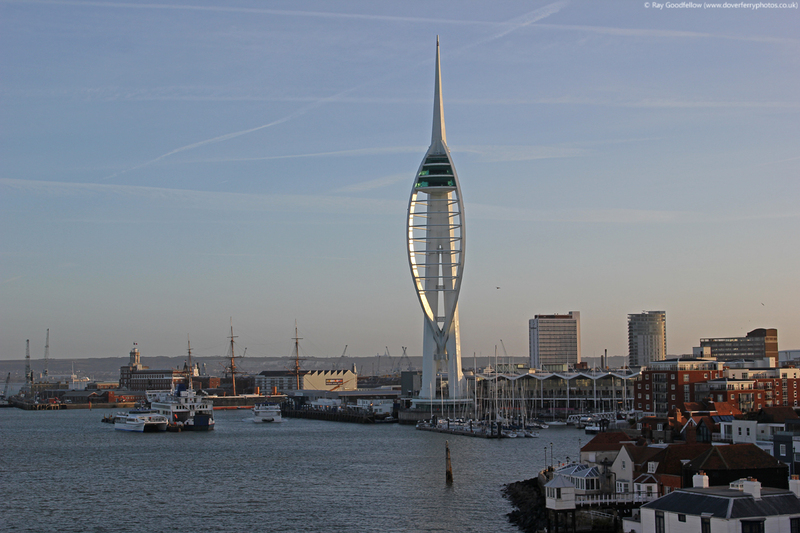 After dinner at Gunwharf Quays we headed to Portsmouth International Port to check in for our overnight crossing to Caen. Check in procedures were completed smartly and soon we were waiting to board the ship. 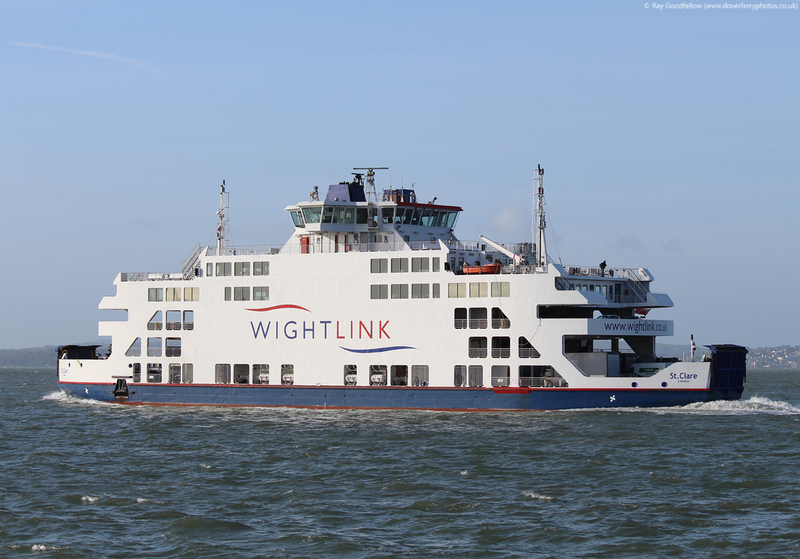 After a protracted wait caused by delays to the Normandies inbound traffic at the UK border we were brought forward for a security check before proceeding to the berth. Looking at the traffic waiting it looked as if this was going to be a busy crossing, no doubt people starting to get away for the Easter break. 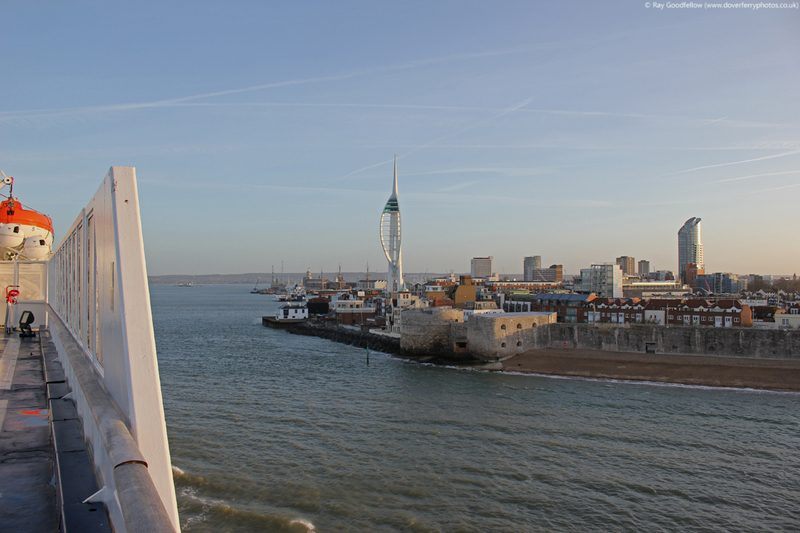 After another protracted wait we boarded the Normandie. For this journey we had booked an outside cabin. After finding our cabin on deck 6 we headed to the bar and then outside to watch our departure. Departure was 30 minutes late due to the weather and the heavy load. 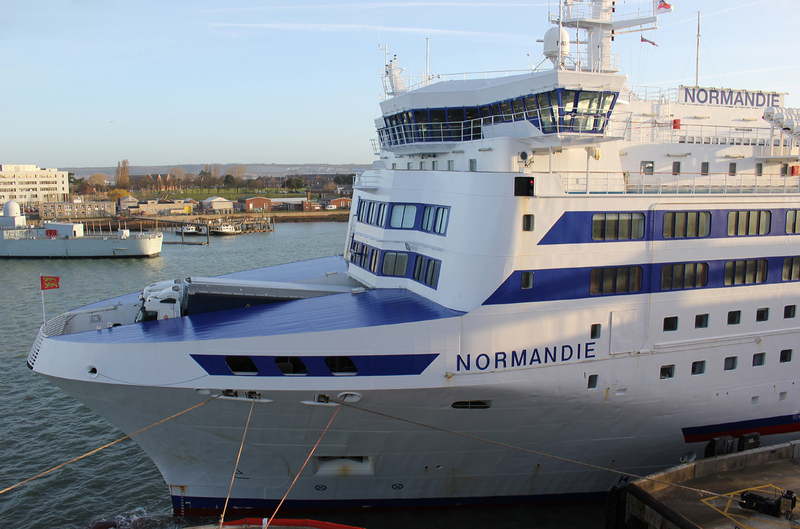 The Normandie has recently returned to service following an extensive refit and the vessel is certainly looking a lot fresher than when we travelled on her last year. 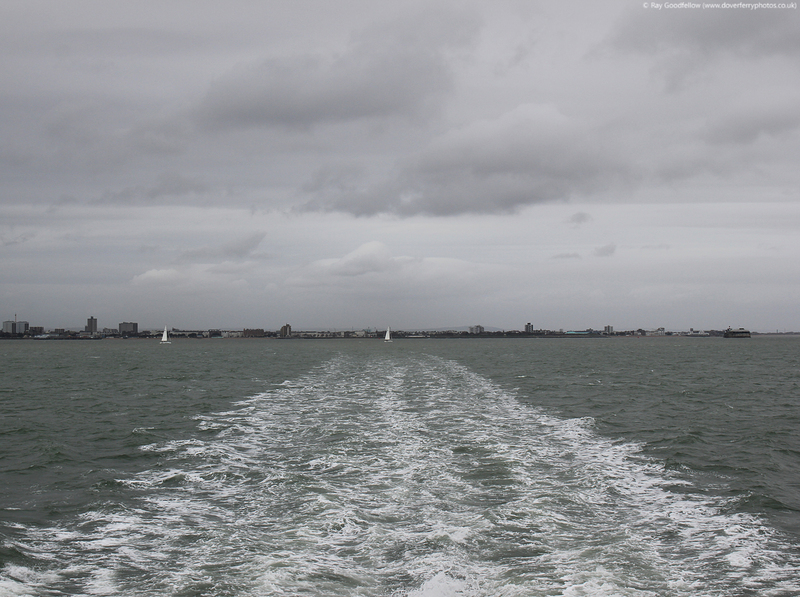 As we rounded the Isle of Wight and headed out into the Channel the full effects of the wind could be felt (by this time it was blowing a severe gale force 9) with the ship moving around a fair bit. With an early start in the offing we headed to bed. As stated the ship was moving around a bit but she handled the conditions really well, especially when looking out of the cabin window when all you could see was spray and a churning sea. 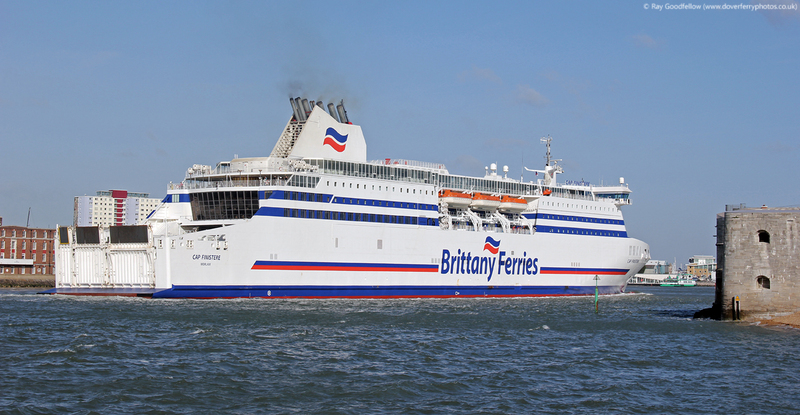 Following an excellent nights sleep the customary Brittany Ferries wakeup call was played over the PA system indicating that we would be berthing in 45 mins. 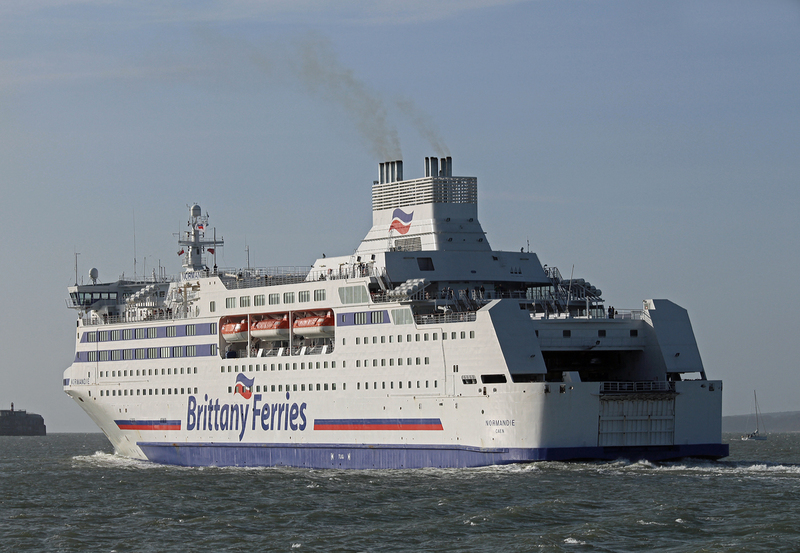 When I say customary wake up call anybody who has travelled with Brittany Ferries will instantly recognise the song ‘Troellenn’ by the Breton folk group Dremmwel. On the third time of hearing this song I decided to get out of bed and hit the shower. Whilst enjoying breakfast in the Riva Bella self service restaurant the lights of Ouistreham were soon coming into sight and with a tug on standby we were soon berthing. 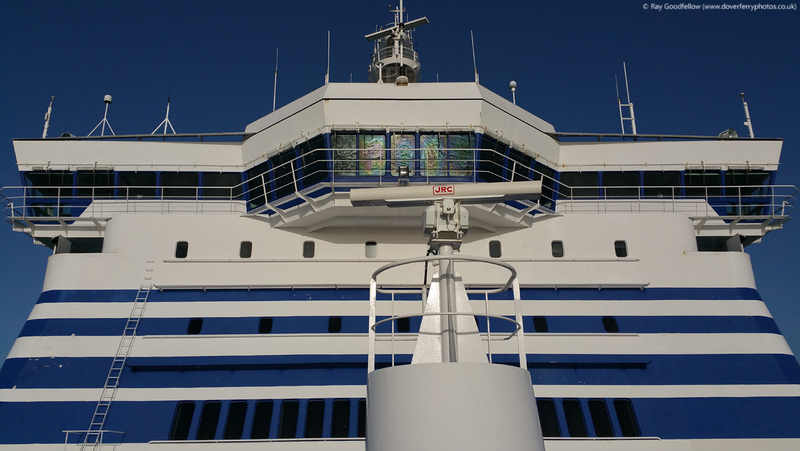 Disembarkation was completed quickly and we were soon heading into Ouistreham. The weather was rather wet and windy at this point with frequent squalls heading through. Following a brief photo call with the Normandie on the far side of the Caen canal we headed off in the direction of Caen to start our journey along the Normandy coast up towards Cherbourg. 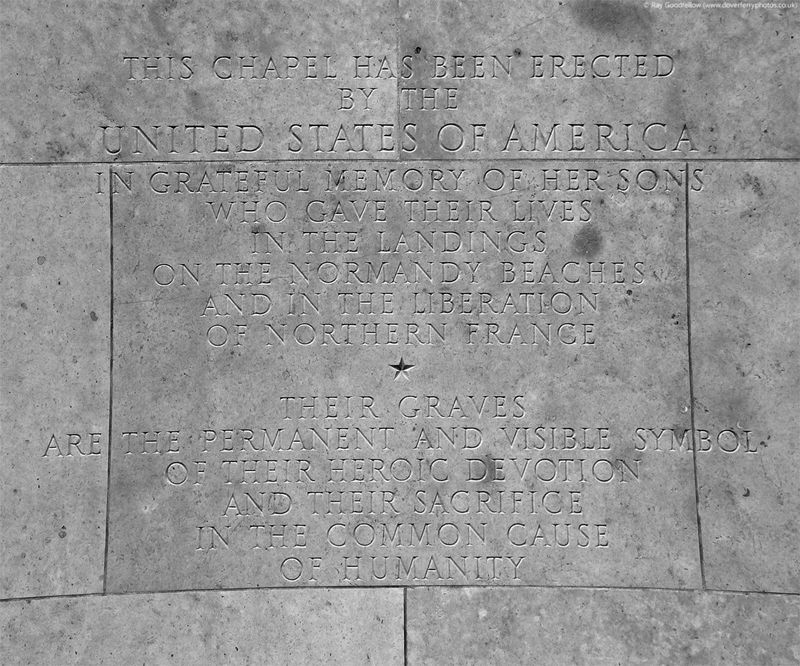 This area of Northern France is obviously well known in the annals of history due to it being the site of the D-Day landings on the 6th June 1944. 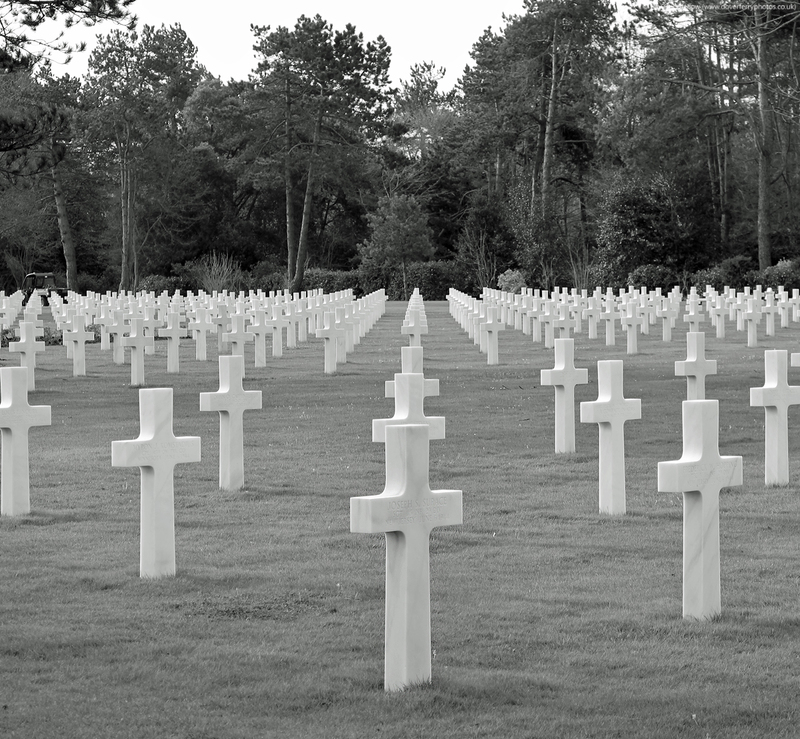 It was from here that the allies embarked to liberate Europe from the tyranny of the Third Reich. As I have stated in previous voyage reports I have a general interest in the historical events of WWII and I always find it quite strange driving along the coast seeing the names of places that I know so much about. 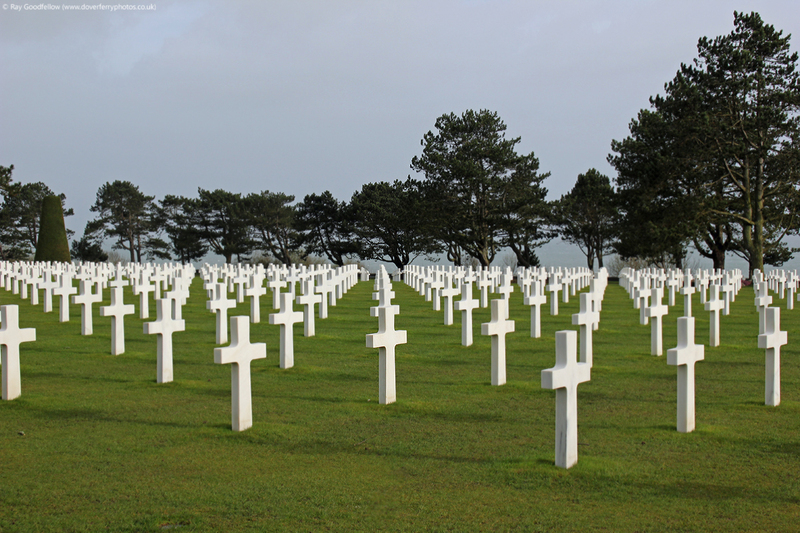 Our first stop along the coast was Arromanches and this was followed by visits to Omaha and Utah beaches. 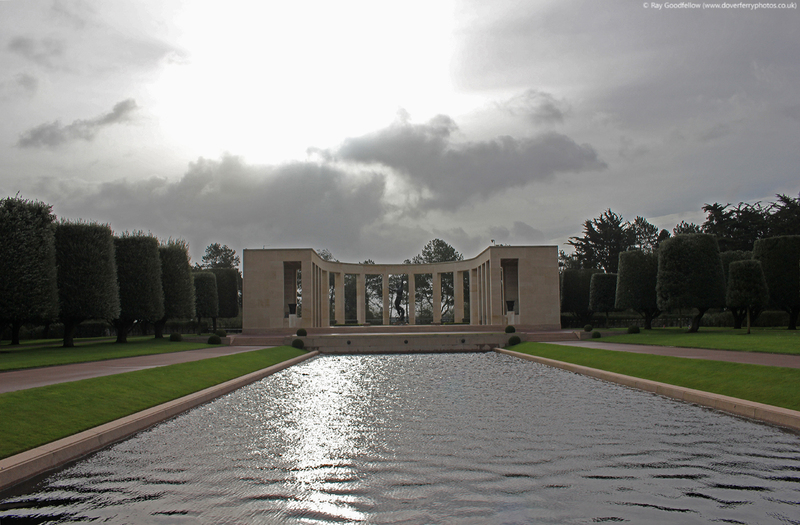 I have visited a lot of the sites along the Normandy coast in previous visits to the area and one of the places that we have never had the chance to visit is the American Cemetery and Memorial. 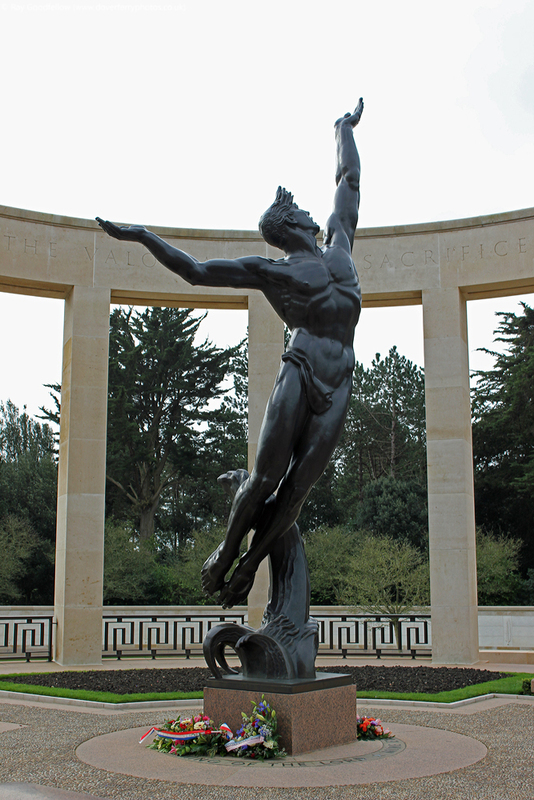 The Normandy American Cemetery and Memorial can be found overlooking the beach at Colleville-sur-Mer. 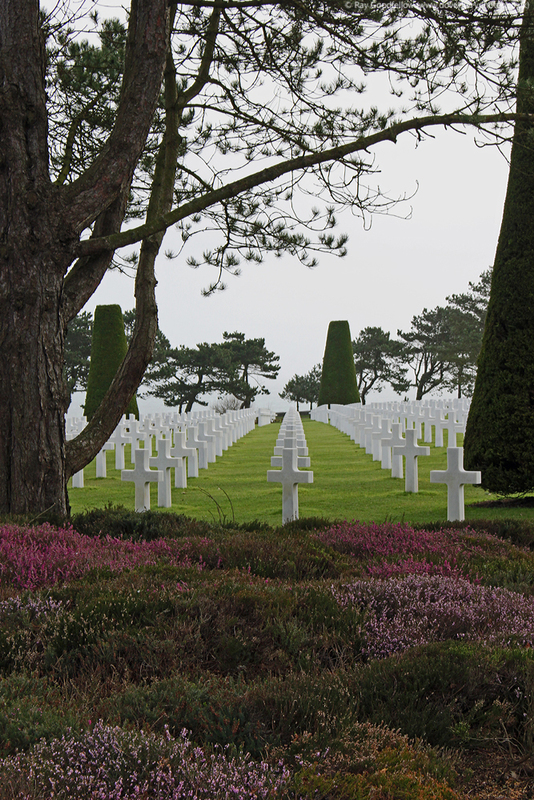 It is located on the site of the temporary American St. Laurent Cemetery, established by the U.S. First Army on June 8, 1944 and was the first American cemetery on European soil in World War II. 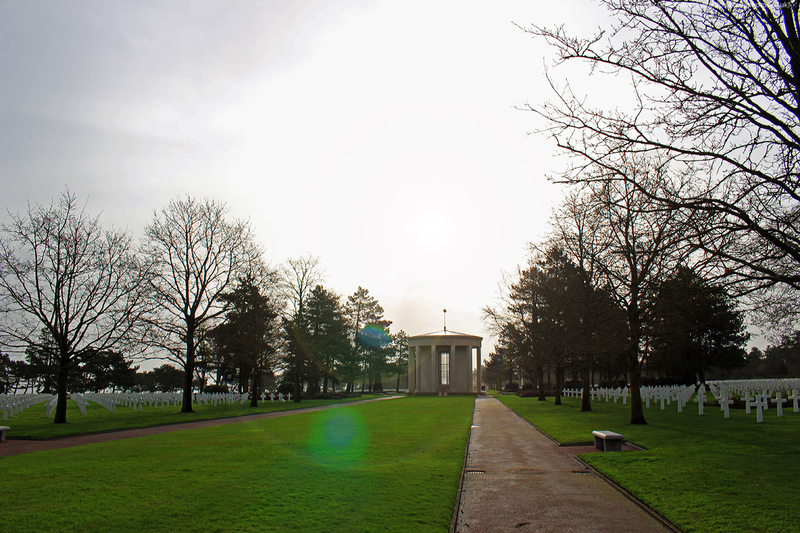 At the north end of its half mile access road, the cemetery covers 172.5 acres and contains the graves of 9,387 soldiers, most of whom lost their lives in the D-Day landings on the 6th June 1944. When we arrived the cemetery had only just opened and it was overcast but it fitted the mood of the occasion perfectly. 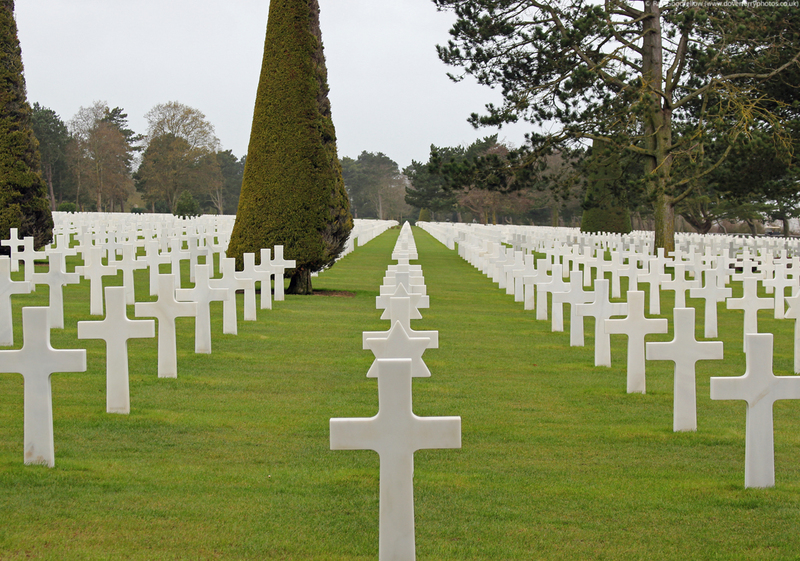 I will say now that the sight of all of these headstones is a truly humbling experience, it’s a very emotional and evocative sight. In the hour we were there I don’t think Paul and I spoke more than 5 words to each other, we just walked around in quiet contemplation. 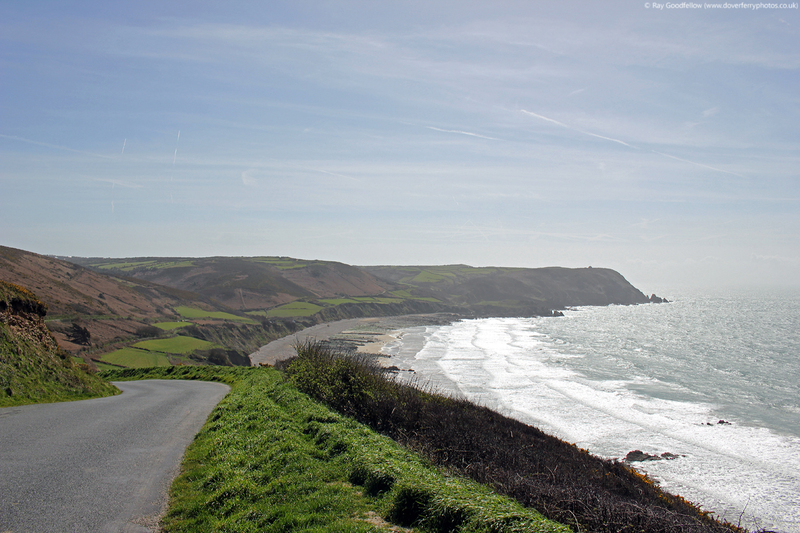 I haven’t narrated these photos as there is no need, the photos say it all but I will leave this segment with a short poem from the late British Normandy Veteran, Cyril Crain as his words convey the feelings felt that morning…. 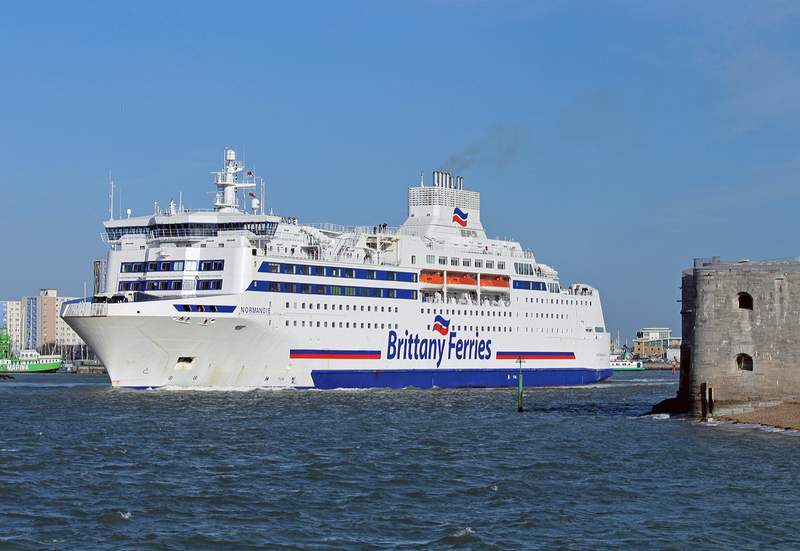 After following the route des caps for a few hours it was time to head South for the area of Mont St Michel and head across the border to the neighbouring department of Brittany and our return crossing to Portsmouth from St Malo on the Bretagne. After a gentle two hour drive south from the Cotentin Peninsula we arrived at St Malo. We immediately headed towards the port and the open check in desk. 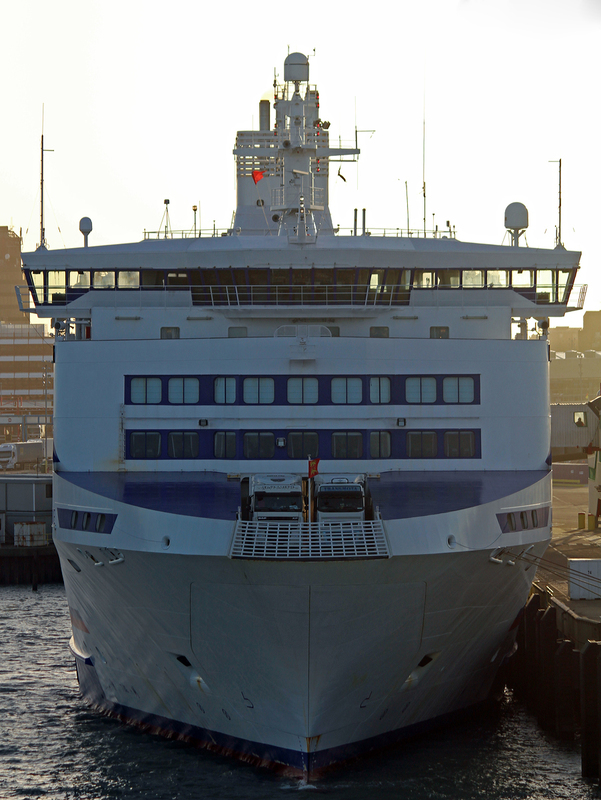 The ship had been having her usual Tuesday layover in St Malo and as a consequence early boarding was available. 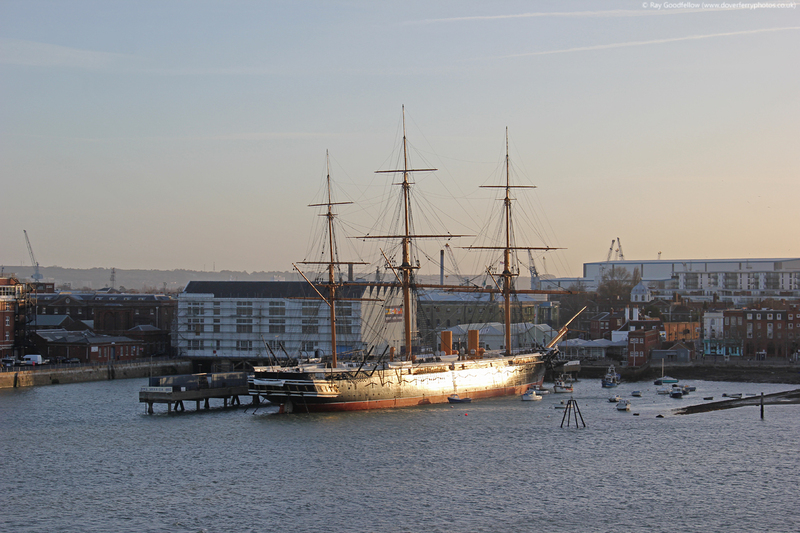 We boarded the ship at 1800 local time and soon found our cabin and settled in for the return journey to Portsmouth. After dinner in the self service restaurant we headed to the bar to watch our departure. 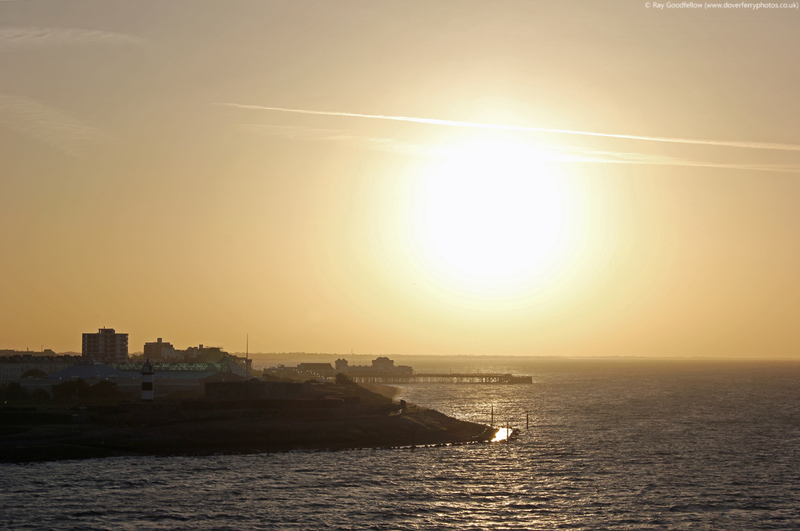 We departed on time and were soon heading out into the Channel once more. As we departed St Malo we passed the Condor Rapide inbound from Jersey. 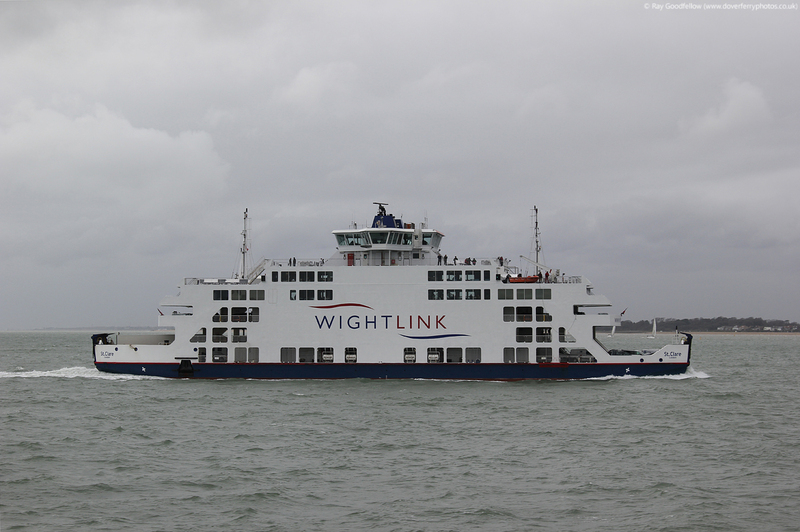 The wind had dropped, especially when compared to the previous night but there was still a healthy swell in the Channel. After a few hours in the bar and with the early start we were soon heading to bed. 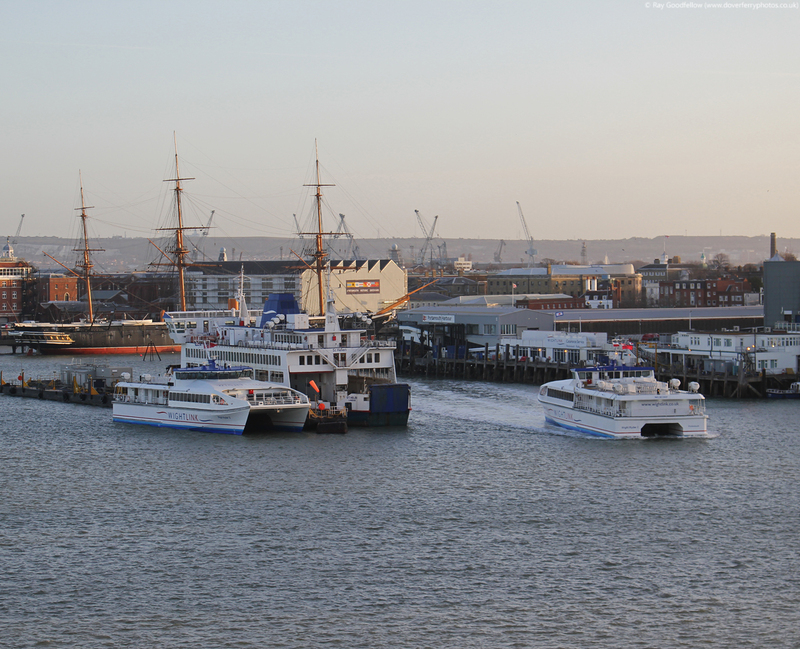 After arrival in Portsmouth and after a short delay we were finally off the Bretagne and heading to the waterfront to catch and document the arrival of the Cap Finistere from Bilbao. 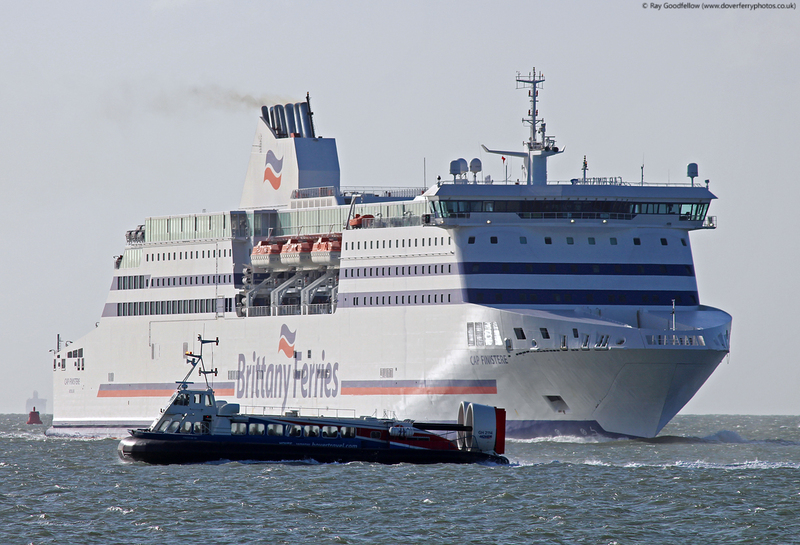 Due to late running following the previous two days of adverse weather and strong winds we were also able to observe the departure of the Normandie to Caen. 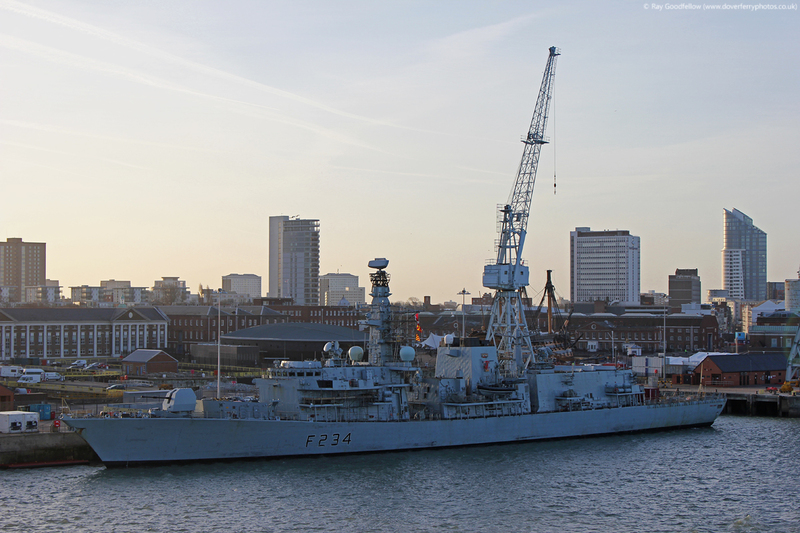 The reason for the interest in both of these vessels was due to the fact that both had recently undergone significant overhauls in Spain which had included the fitting of exhaust gas cleaning (scrubbing) systems on both vessels, as a consequence of this both vessels had to have there funnels extensively remodelled to accommodate the new bulkier equipment. 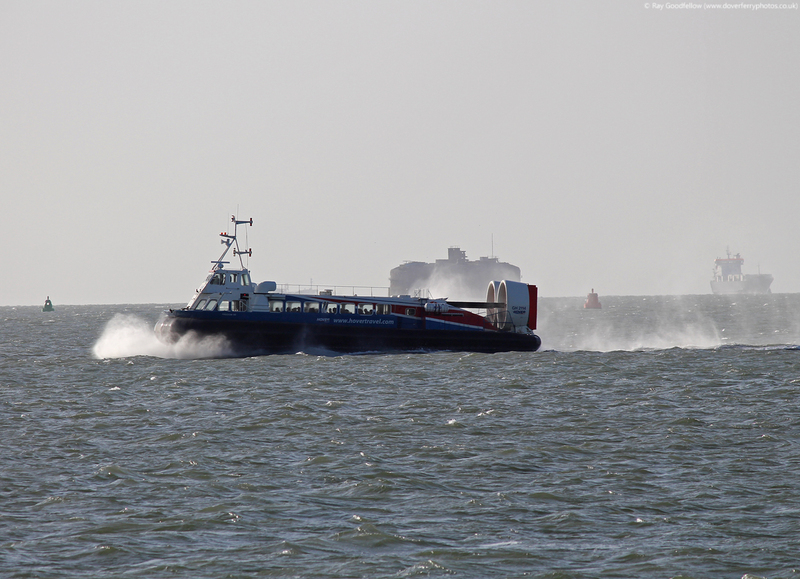 In the case of the Cap Finistere it meant that she lost her characteristic ‘Superfast wings’ from her funnel. 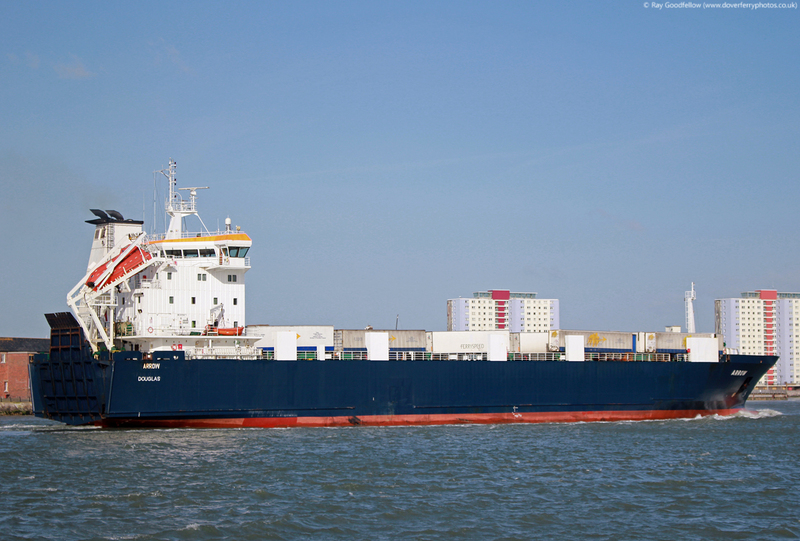 In an effort to reduce greenhouse gases produced by the shipping industry the International Maritime Organisation (IMO) announced that ships trading in designated emission control areas would have to use fuel oil with a sulphur content of no more than 0.10% from 1 January 2015, this was compared to the previous limit of 1.00% which was in effect up until 31 December 2014. 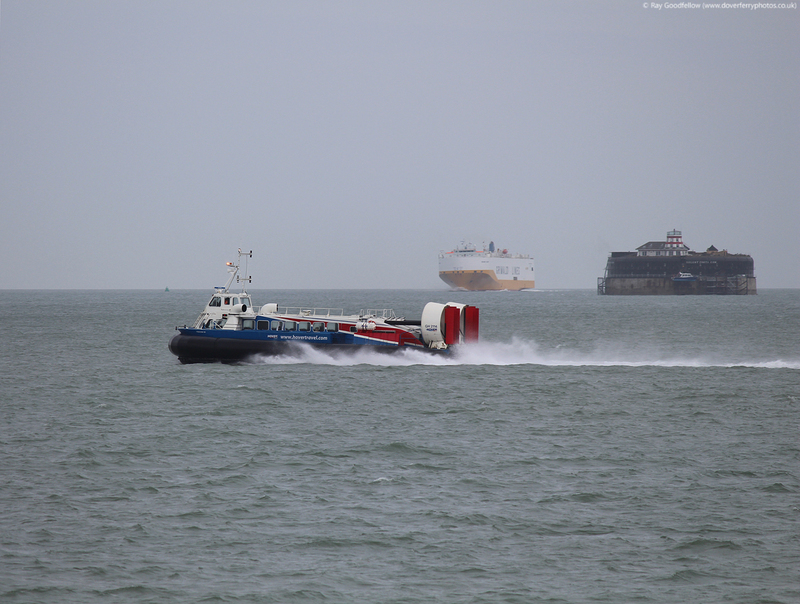 This new regulation covered the use of fuel in both the main and auxiliary engines. 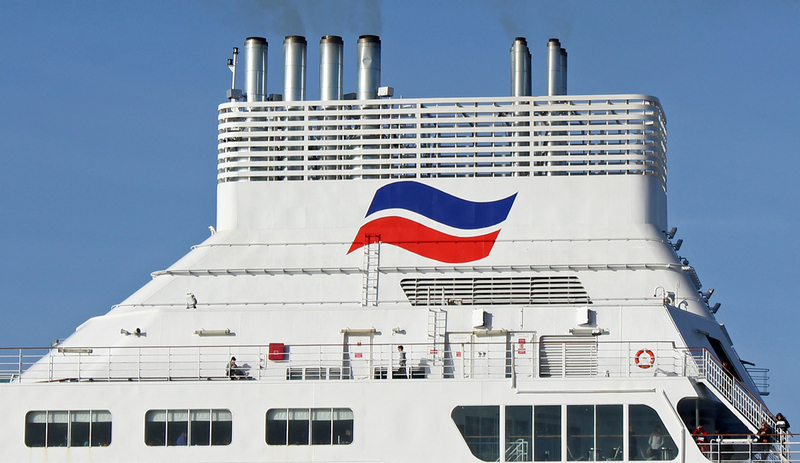 Brittany Ferries operate ships in the first control area to ‘go live’ with the new regulations in Europe (The areas covered are the North Sea, English Channel, Eastern side of the Western Channel and Baltic Sea). 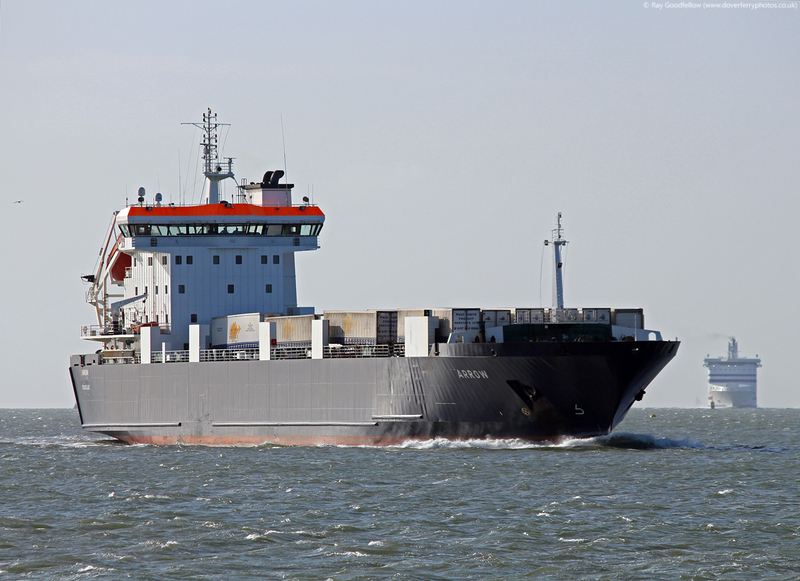 Shipping companies have a number of options available to them to comply with the new sulphur regulations. 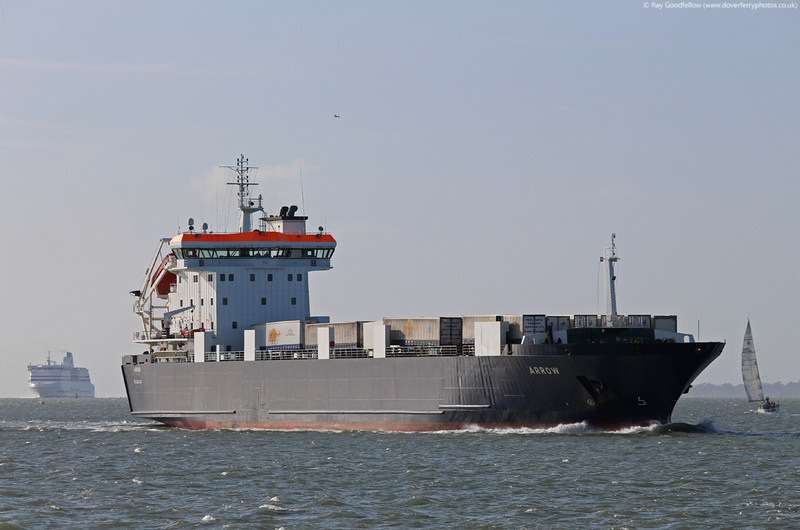 They can use low sulphur fuel oil with a sulphur content of no more than 0.10%, however this would result in a significant increase in bunkering costs as low sulphur fuel oil is more expensive than the previously used fuel type. Some operators have moved over to Liquid Natural Gas (LNG) and Methanol as a fuel source. 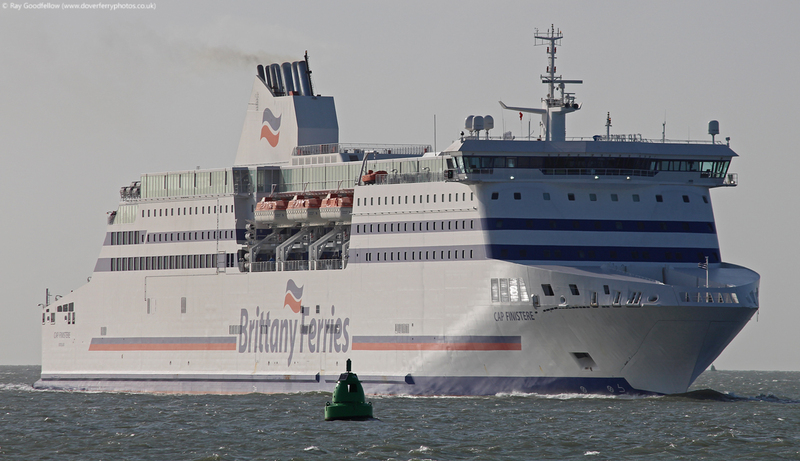 Originally Brittany Ferries did look to converting the majority of their fleet to LNG as a fuel source but this was discounted due to the infrastructure costs involved. 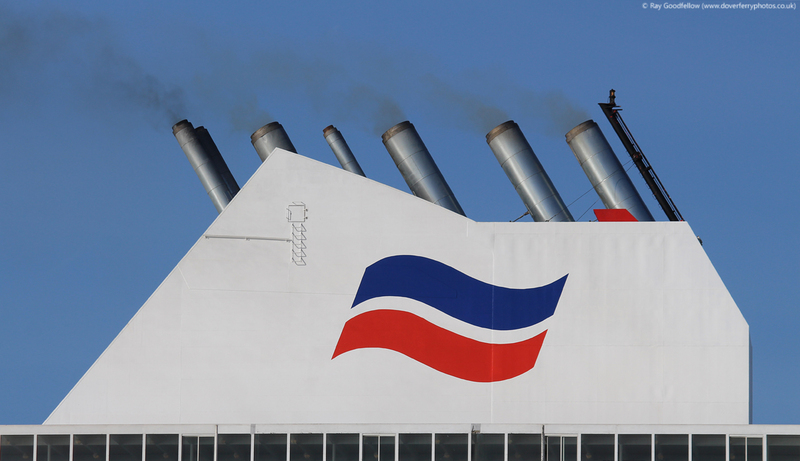 The other option available to shipping operators is the fitting of an exhaust gas cleaning system (‘scrubbers’). 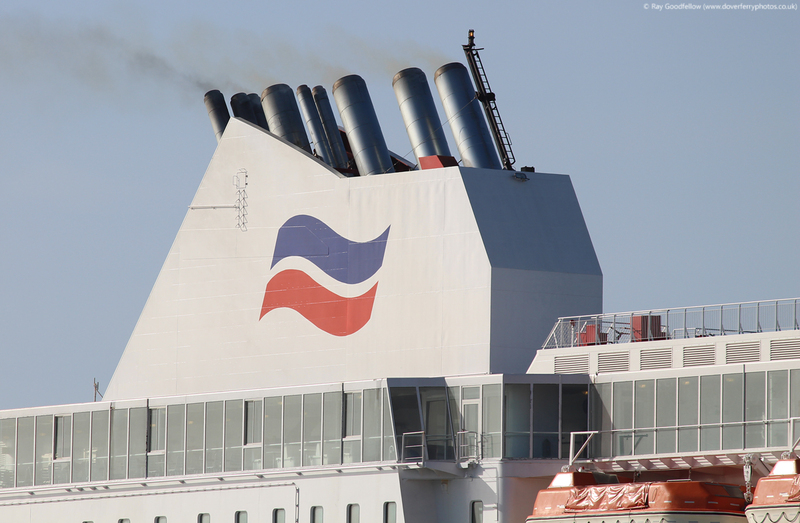 Situated in the funnel of a ship these systems use seawater to wash the exhaust gases produced by the engines effectively washing out the sulphur dioxide and other harmful particulates. 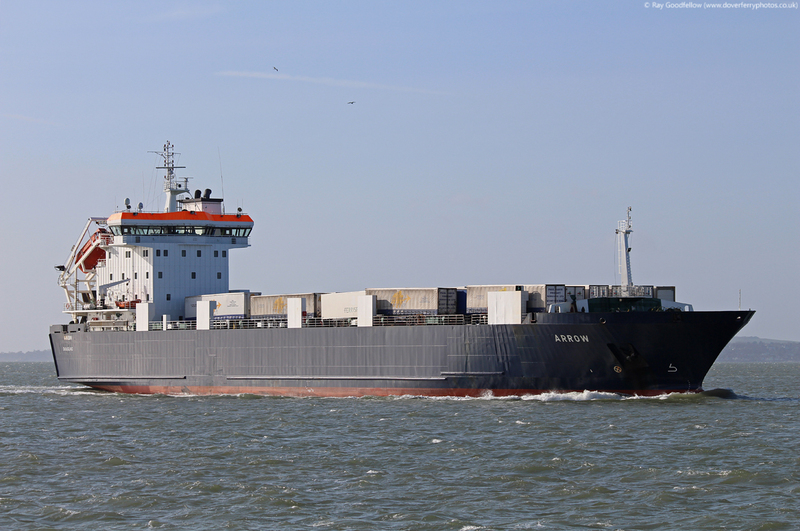 This system allows the shipping operator to still burn the older style heavier fuels and to stay within the new regulations. However it should be noted that the fitting of scrubbers to a ship is an expensive and time consuming task. 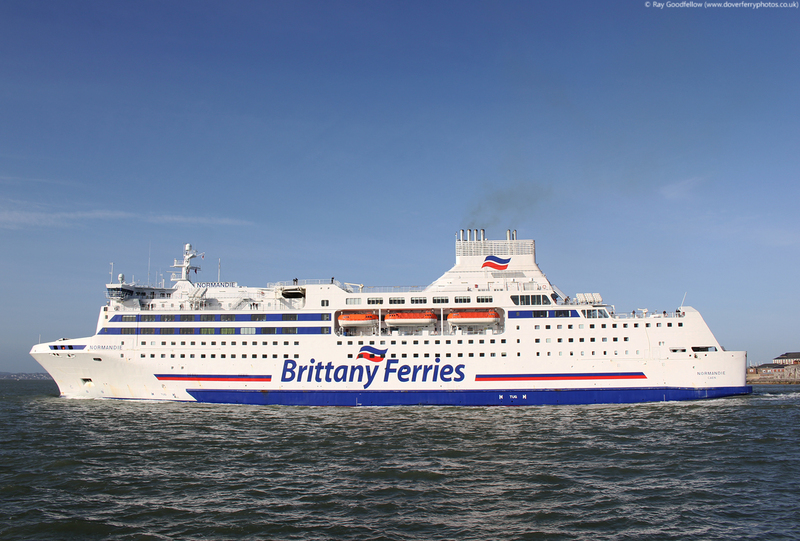 Brittany Ferries has invested around £10 million per ship with the work taking around 10 weeks per vessel. 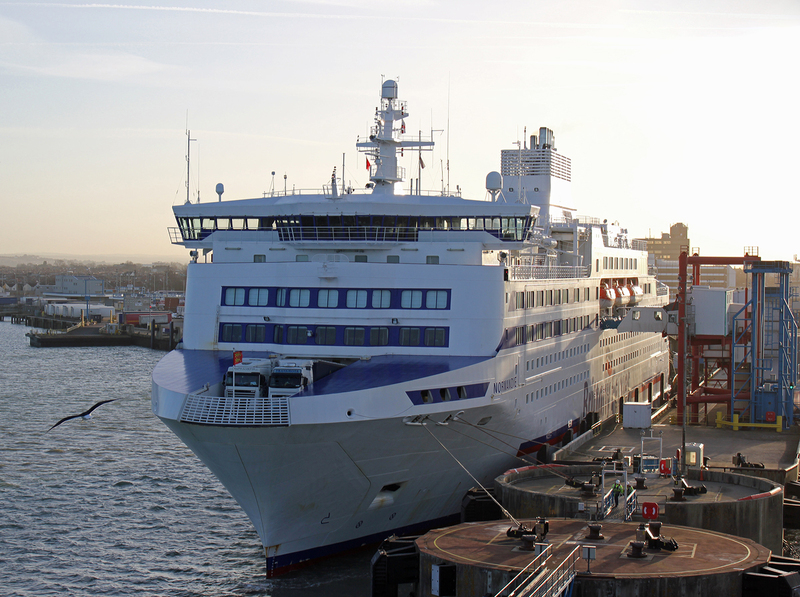 So far the Normandie and Cap Finistere have already been converted. 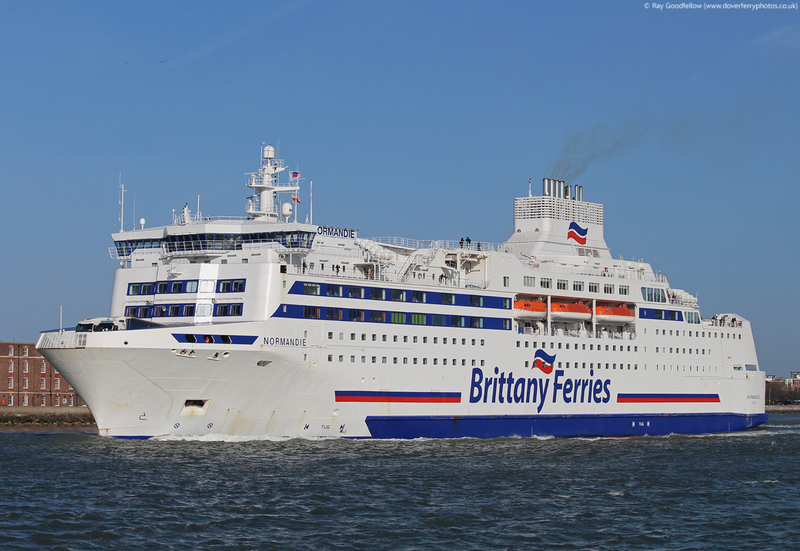 The Barfleur is currently in Spain having her system fitted and is due to return to service in May 2015. 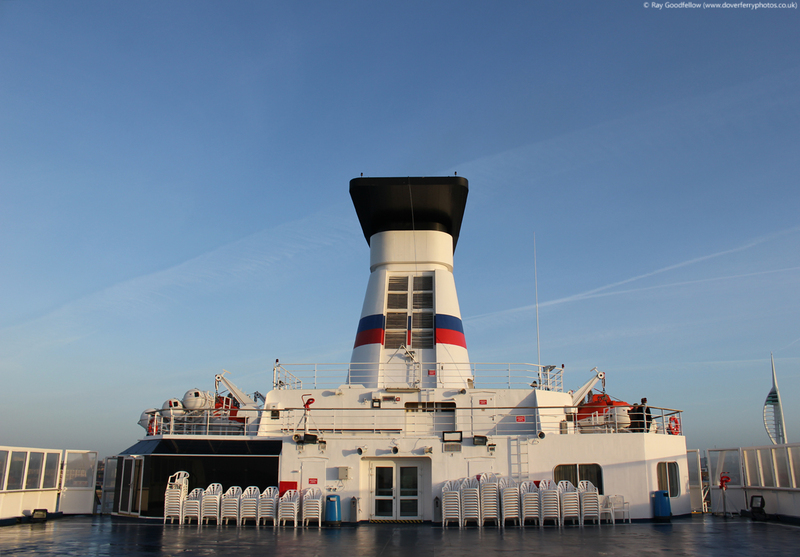 Next year will see the conversions of the Mont St Michel, Pont Aven and the Armorique. 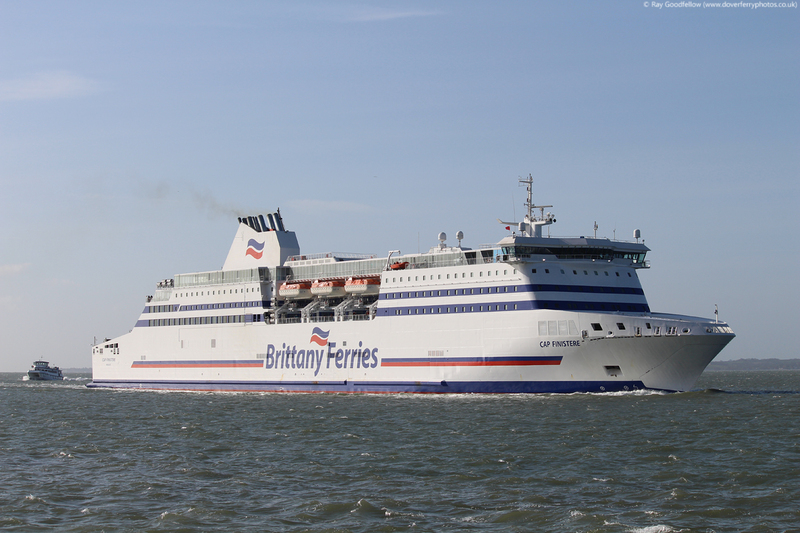 At this time the Bretagne will not be converted and will instead use the low sulphur fuel oil. 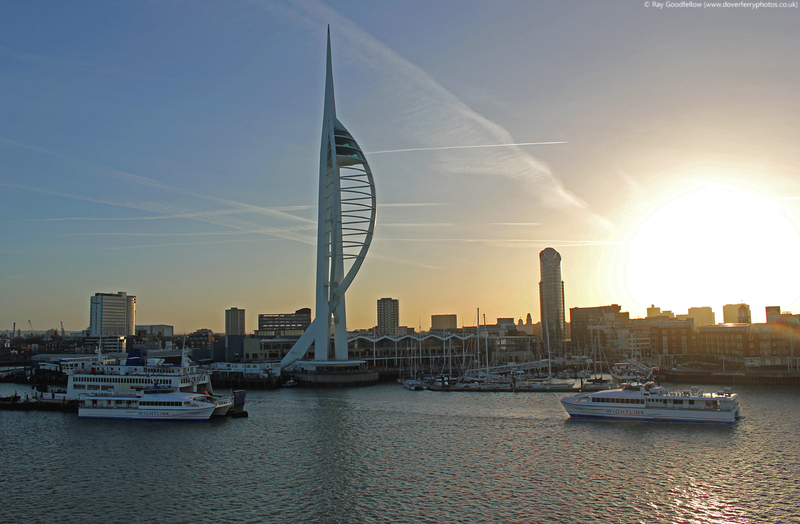 The weather in Portsmouth was glorious as we arrived at the waterfront. Gone were the dark grey skies and gale force winds of the previous few days however as bright and sunny as it was it was cold, it felt more like a winters morning than that of a Spring day. 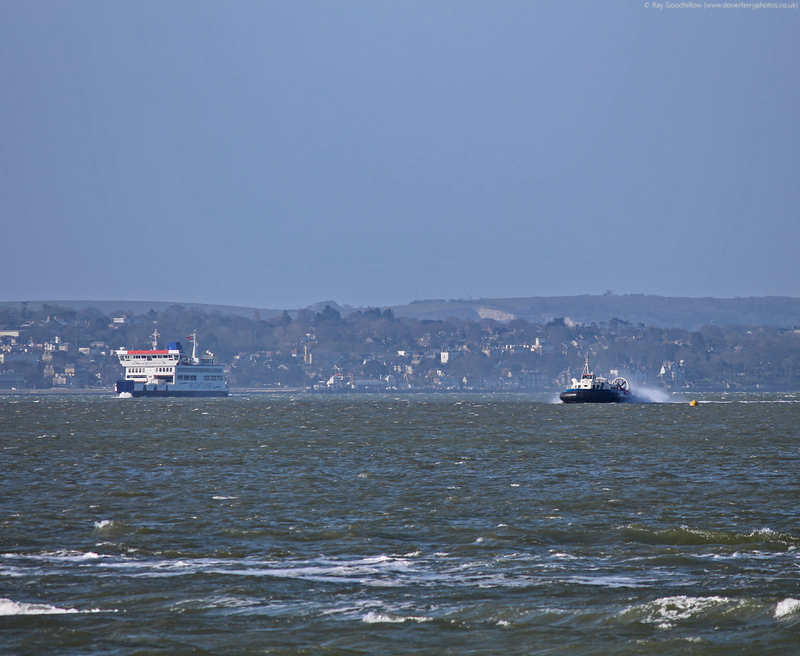 Shortly after arrival we witnessed the departure of the Normandie for Caen, this was followed by the arrival of the MV Arrow inbound from Guernsey. 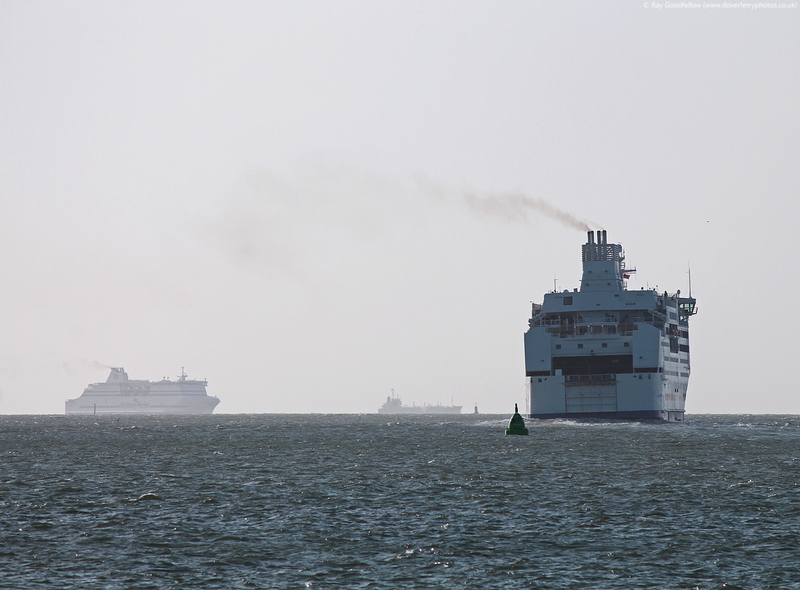 Shortly after the arrival of the Arrow the Cap Finistere was soon in the approach channel and entering the port. 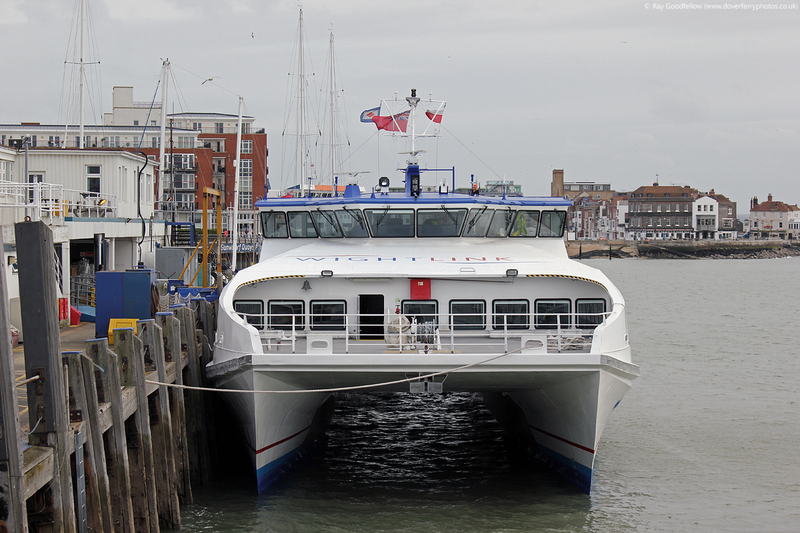 This article and all photographs featured are the copyright © of Ray Goodfellow (Dover Ferry Photos) 2015, All rights reserved. Images posted in this article may not be reproduced or shared without permission.